First, a great mod, but recently I want to remove or disable this integration from my server, I'm actually using All The Mods 3 from Twitch. Already deleted the mod from mods folder, but the integration is still functional. Any ideas on how can I remove it? You can just disable the mod in the Mods Options menu. That worked for me. Updates will restore functionality though. 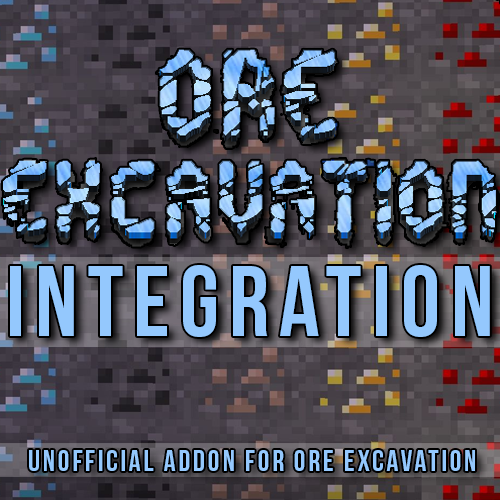 Can I suggest something though, bit weird but could you put a space between 'Ore' and 'Excavation'? Reason is when I search for Ore Excavation in twitch mods list this doesn't come up because it has no space and sometimes I forget to grab it. Where do you find this enchant? Done some pretty extensive testing and it doesn't show in the enchanting table, and I've yet to find a villager selling the book. I think something neat would be to add a drill augment for the actually additions drill that allows you to ore excavate with that, since most people advance to that after tinkers' tools. It's just an idea though. I think it would be cool if they did that but make sure to check on your facts. A lot of people use the drill before tinkers, I dont see why you would go from tinkers to drill considering tinkers can be a lot faster depending on the materials you make it out of. Even without any mods that add extra modifiers. Excelent mod! You should fix the name of the enchantment and modifier though. Could you please update to 1.12 soon? I have 3 questions. 1. how do i add tools and blocks in the blacklist. 2. how do i actually activate it so i can veinmine 3. do hammers in sky factory 3 work with this mod.